Ghar Bachao Ghar Banao Andolan (GBGBA), Mumbai's civil rights organization, fighting for the slum dwellers' rights, feels that the resettled residents of Mahul, considered the city's toxic hell because of extreme industrial pollution, have been cheated after Maharashtra housing minister Prakash Mehta promised them to be shifted to Kurla's Housing Development & Infrastructure Limited (HDIL) area. In a statement, GBGBA says, in a virtual about turn, state Chief minister Deverndra Fadnavis has expressed helpless in providing "safe housing" to the poor residents of Mahul, who are agitating against the unlivable conditions in the flats where they were shifted from the Tansa pipeline after they were declared illegal encroachers one-and-half years ago. Housing minister Prakash Mehta had assured residents of Mahul that all of them can be given houses in Kurla HDIL. The assurance was given under pressure from the residents of Mahul who are agitated by Government's non-compliance of the High Court's order which had directed Government of Maharashtra to relocate Mahul residents as the area is hit by a worst level of industrial pollution. However, Maharashtra chief minister Devendra Fadnavis said the tenements in Kurla cannot be allotted as they are under litigation. What CM offered to do as part of the solution of the problem is only sanctioning the 350 houses, which were offered by the Maharashtra Housing and Area Development Authority (MHADA) to Mahul residents. This is not the complete solution as total families living in Mahul are around 5,500. A meeting was taken on Tuesday by the Chief Minister on the insistence of Shiv Sena youth leader Aditya Thackrey in presence of MHADA president Uday Samant and Thackrey. None of the representatives of Mahul residents were called for the meeting. What is offered by the government is not something the government benevolently offered, as in past the government had outrightly rejected to provide any alternative tenements. It is only after hard-earned negotiation and initiative of Shiv Sena youth leader that the MHADA offered these tenements. It is also not the case that there are no tenements available at all. In fact, through RTI we have found that there are almost one lakh tenements available in Mumbai which are meant for Project Affected Persons. So, this means that if the Kurla HDIL tenements cannot be allotted then there are still umpteen number of tenements available which can be allotted to Mahul residents. What is lacking is simply government will to save to the lives of Mahul residents who are under constant life threat due to worst level of industrial pollution in the area. The Chief Minister does not even have the courtesy to meet the representatives of the Mahul residents to discuss and resolve the issue. The residents have been trying to meet him for more than a year. 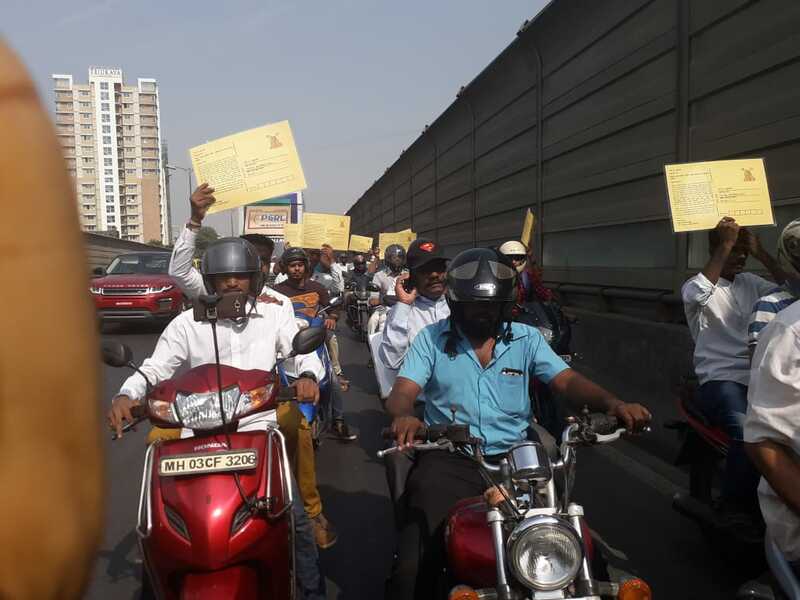 Agitated by this callous behaviour of the government, resident took out a bike rally today to Mantrayalay. They displayed large postcards which were addressed to the chief minister reminding him about meeting the residents. Few of the bikers were detained by the police for such for taking out the rally. Today's police action sends out only one message that it is a crime today to even demand protection of life. For more than a month, are sitting on protest at Vidya Vihar by the residents of Mahul who are demanding compliance of High Court's order which directed the Government of Maharashtra to relocate the residents of Mahul. The Chief Minister's statement has agitated the residents by his insensitive way of addressing the issue. More than hundred people have died so far due to the pollution in Mahul. Looks like he is waiting for more people to die to act. The future course of movement of Mahul residents will be decided and announced soon.